FREE BONUS: Download our Charity Auction Planning Guide. You can save this resource as a PDF and use it for your organization’s next charity auction event. Take your next auction to the next level with this downloadable resource! Charity auction items are arguably the most important part of hosting a charity auction, right? They’re the main attraction of the evening, after all! If you’ve already taken the time to plan some logistics and identified the key software or tools you’ll use to manage your event, all that remains is finding the perfect items. The right live or silent auction items will energize your attendees and maximize donations to your mission! When planning a charity auction, it’s important to consider the size and demographics of your base of support. Have your procurement team draw from a wide variety of ideas to find a perfect range of items that appeal to everyone. This will ensure an engaging evening for your guests and a profitable event for your organization. These auction item ideas are some of the most popular and reliable choices for nonprofits hosting live charity auctions. These favorites span a range of budgets, making them adaptable for organizations of all sizes. Big-ticket travel packages are classic auction items because they work. They’re extremely effective at drawing crowds, anchoring your event marketing campaigns, and generating some healthy competition on the big night. Plus, with consignment packages, these auction items are within reach for events of all sizes. By partnering with a consignment item or package provider, your organization pays only for what sells. This ensures that your big-ticket items like travel packages can serve to excite your guests and generate more bids for everything else without risking your event’s budget. 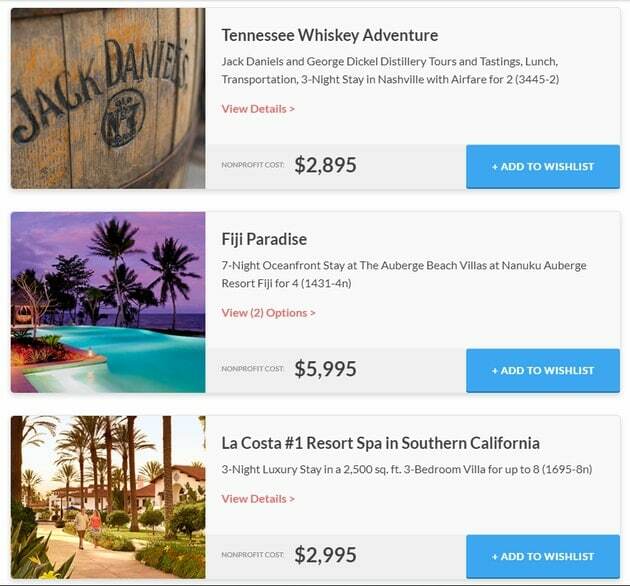 Look for travel packages that are sure to appeal to your donor base. Exotic getaways are always popular, but family-friendly vacations and packages geared towards either older or younger donors might be a smart move depending on the demographics of your audience. Explore your options, and get ready to heavily promote your big-ticket travel package! Your auction item procurement team should be on the lookout early in the planning process for any upcoming live events that generate a lot of interest. A hit Broadway musical is a great example; if your organization can afford to secure tickets early, you’re guaranteed to raise plenty of support once the show’s been sold out for a few months. Don’t forget to explore your options with consignment package providers, or even consider soliciting donated tickets from artists or venues, too. Who doesn’t love a great meal? Fine dining experiences have long been one of the most reliable auction item ideas for nonprofits. Restaurants are often happy to donate special reservations and meals to good causes because it generates great publicity, building stronger relationships with the community at large. Dining-themed auction item ideas are great for filling out your auction with reliable performers. They ‘re not typically the big-ticket items that get donors in the door, but they’re excellent for driving revenue across the event as a whole. It seems like every week there’s a new tech toy grabbing the world’s attention. This makes technology a very effective way to tap into your audience’s excitement for all things shiny and new. It’s possible to find tech toys that can engage any audience (young and old) and for any budget. Reach out to local retailers or auction consignment services to procure some perfect auction items for your next event. These are some fairly common examples, but gift baskets are an extremely flexible way to adapt your auction items to your organization’s audience. Try splitting your guest list into a couple distinct donor personas based on various demographic characteristics. Develop a themed basket targeted to each persona’s interests and hobbies. This can be a great way to cover your bases at your next auction. Remember, even without a single main attraction item like a luxury getaway, your auction can be a huge success with a few perfectly-developed themed baskets that pack tons of value into a single package. Silent auction fundraising events often require a slightly different approach when building out your item catalog. When it comes to these events, focusing on creating attractive packages is a smart move. Other silent auction items that tend to perform well are those that provide continued value for an extended period. Here are a few of our favorite top performers for silent auctions. Spa Day at Home package – everything your winner needs to pamper themselves at home, like bath products, face masks, candles, incense, etc. Whichever approach you choose will depend on the specifics of your event and your audience, but the main idea is tap into your donors’ desire for a quiet, relaxing, and luxurious experience. Think about what your organization’s audience would like, then gather the perfect items. A year-long membership to a local museum is another great silent auction item idea because it provides long-term value. Reach out to the top art museum, natural history museum, nature center, or children’s museum to solicit a donated annual membership. These institutions are typically nonprofits themselves and will likely be eager to form a mutually-supportive partnership. A museum membership is also a great item for your silent auction because it can easily stand on its own as an appealing item, but it can also make a great centerpiece for a package of items if need be. With silent auctions, it can sometimes be more difficult to maintain high energy across the entirety of the event; this means organizations might need to bundle more of their items together in order to prevent creating a buyer’s market in which some items might not receive much attention on their own. Auction items, like museum memberships, that provide long-term value are perfect for silent auctions because they can be easily adapted to stand alone or be bundled in a package. A classic item idea for charity auctions, wine is an old stand-by for a few reasons. You can find nice wines that suit a wide range of budgets, tastes, and audiences, but competition will really kick into high gear if you’re able to secure a particularly rare vintage. If your audience would be interested in bidding on wine, explore your options. For silent auctions, creating a package of several bottles can be a good idea, and including wine in one or two of your themed baskets or food-related packages is an easy way to boost their value and appeal. Especially valuable bottles can typically stand on their own for bidding, though. If you have enough bottles on hand, you might even create an additional activity for your silent auction event. They’re called “wine walls” or “wine pulls”, and they’re one of our favorite ways to increase revenue and guest engagement at events. Learn more about wine walls with our guide. Alternately, you might choose to take a more “relaxing rainy weekend at home” angle when designing your staycation package. In this case, try including various beauty and bath products, candles, snacks and drinks, movies or books, and gift certificates for food delivery services. You can take a flexible approach to this auction item idea, but just be sure to consider what sorts of items will best catch the attention of your organization’s donor base. As digital streaming becomes increasingly popular, more and more consumers are looking for easy ways to “cut the cord” and move away from traditional cable television packages. For many, winning a subscription to a top streaming service is the perfect motivator! Netflix, Hulu, and Amazon Prime are the most popular choices, but look into making the subscriptions even more appealing for your audience with add-ons like HBO and ESPN. Streaming service subscriptions make effective silent auction item ideas because they’re cost-effective and offer donors year-long value. For guests that have been considering trying out a streaming service for the first time or want to add to their own streaming options at home, this is a great item to offer at your silent auction. FREE ONLINE TOUR: Find the best tools for your next fundraising auction! Test drive OneCause to see how we can take your auction to the next level! The best way to catch the attention of bidders at your silent or live auction event? Show them something new! Unique auction item ideas are a great way to boost revenue and guest engagement, and the right items will generate a lot of competition. Unique art pieces are always a smart move, but there are tons of ways to catch your guests’ attention. 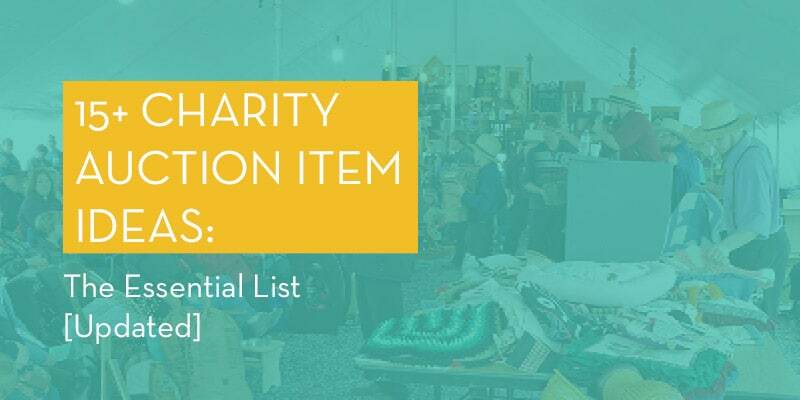 These are a couple of our favorite unique auction items that tend to perform well for nonprofits, but take the time to consider what your particular donor base will find exciting, too. Celebrity meetups are a classic auction item idea because they reliably generate a lot of interest from guests. If you want to offer a celebrity meetup, like a lunch or dinner at a popular restaurant, have your procurement team start by carefully considering your audience. If your organization or charity has partnered or worked with a celebrity in the past (or if you have any famous names on your donor list! ), start by reaching out to them or their managers to discuss donating some time. Partnering with charities is excellent publicity for celebrities, and many are eager to contribute to causes that they hold dear. Medical research and educational causes, for instance, regularly offer celebrity meetups to their auction donors. Think about which public figures your donors would love to meet, or which celebrities your donors’ kids would love to meet. For the best results, make sure that the celebrity is interested in your mission and that their work is as relevant as possible to your donors’ interests. Golf tournament fundraisers have long been an extremely reliable way for nonprofits and charities to get their donor bases up and excited to have fun supporting their cause. We definitely recommend hosting a golf-based fundraising event if your donors would be interested. However, even if a full tournament isn’t possible, offering professional golf lessons is still a great idea for your next live or silent auction. First, determine whether or not your donor base would be interested in golf-related auction items. Next, have your procurement team explore your area and see if any current or retired pro golfers live nearby. Like other professional athletes or celebrities, pro golfers are typically eager to help support good causes in their communities. Try to think of items that parents will want or that their kids will want. Going the route of offering special perks is a reliable way to generate interest and bids. Best of all, these ideas won’t cost your school a cent to offer! A hot air balloon ride is an exciting, once-in-a-lifetime experience, making it a perfect and unique auction item idea for your live or silent event. Research any hot air balloon ride services in your area, and reach out to any local balloonists to ask if they’ll donate a morning or afternoon ride for your cause. If you’re offering bundled vacation or experience packages in your auction, consider adding a hot air balloon ride to increase its value. Think “Ultimate Napa Valley Getaway”. Hot air balloon rides can be fairly expensive, so if you can secure donated services, you stand to offer your guests an exciting and extremely valuable auction item! As the cost of childcare continues to rise, more and more families are looking for ways to offset the costs. If your donor base largely consists of parents and young families, or if you’re organizing a school auction, free childcare packages might be excellent and unique auction item ideas to consider. Reach out to local, reputable childcare services, including daycare centers, after-school programs, and professional nanny services. Discuss arranging a donation of their services or a reduced rate that your nonprofit could pay once a minimum bid has been reached on the childcare package. However you choose to arrange the logistics of this auction item will depend on your organization, your partner, and the preferences of the winner. The main idea, though, is that this auction item will be extremely popular among the right donors with young children. You’re bound to generate some healthy competition with this one! When planning any type of charity auction, it’s important to draw from a wide range of auction item ideas! Use this list as a launching pad as you continue to plan and procure all the items and packages you’ll need. By considering your supporters, their needs and abilities, you can find the perfect items to get them excited and engaged. Our Comprehensive Guide to Charity Auction Software. Learn the ins and outs before making any important decisions! The right software can make a major difference for your event. 45+ School Fundraising Ideas from Funds2Orgs. Raising money for your school? Be sure to brainstorm some extra ways to raise funds on the night of your big auction! 17 Phenomenal Fundraising Event Ideas. Looking for other ways to engage supporters in addition to your auction? Look no further. We’ve picked a few of the most effective fundraising events out there. Top 5 Silent Auction Donations to Make Your Event Profitable. Looking for big-ticket items? Use our list to get started looking for donations in the right places.